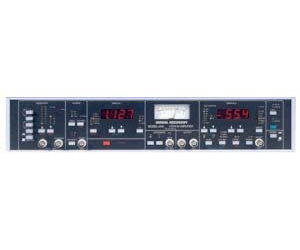 The SIGNAL RECOVERY model 5209 is the benchmark single-phase lock-in amplifier against which others are judged. It is widely referenced in technical publications describing a diverse range of research applications including optical, electrochemical, electronic, mechanical and fundamental physical studies. We also offer a dual-phase version, the model 5210. Although the introduction of instruments using digital signal processing has brought advances in phase sensitive detection techniques, units using analog demodulators are still the first choice for many experiments. These include those requiring a true analog output, for example in some feedback control loops, or where the instrument is used to recover the envelope modulation of a "carrier" frequency. Of course, they are also chosen for compatibility with previous experimental setups.